Over the past five weeks we’ve made contact with dozens of Windsor Heights residents and visitors to help them learn more about our support of reclaiming a Main Street for Windsor Heights. 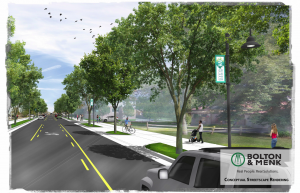 The University Avenue Redesign Project, we feel, is vital for our communities future growth. We are now prepared to do informal “house parties” where you can invite your friends and neighbors to your home to learn more about the project. To schedule your University Avenue Redesign House Party call us at 515-331-3207 and let’s get together to answer questions. Meet Action Coach Monte Wyatt the newest member of the Windsor Heights Chamber. Monte does executive and leadership coaching and is behind Live2Lead Des Moines an event coming on 12 October. 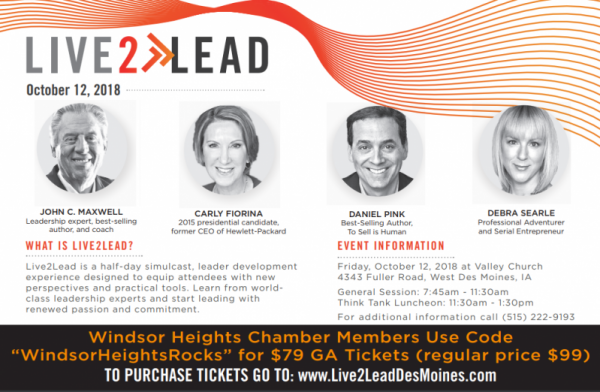 This is the 5th year for Live2Lead Des Moines and featuresJohn Maxwell, Carley Fiorina, Daniel Pink and Debra Searle. Monte is offering his fellow Chamber Members a special rate to attend the event being held at Valley Church. The regular cost is $99 per person but WH Chamber Members can get their tickets for $79 each. To get tickets head to Live2LeadDesMoines and then to “Tickets” enter the promotional code WindsorHeightsRocks to get your deal. Welcome Monte! We’ve got TWO Ribbon Cuttings coming up in September. Our first is at Peterson Painting on Friday 14 September at 10:30am. Peterson Painting does commercial and residential painting and is brand new to Windsor Heights. Peterson Painting is at 2110 63rd Street. Make sure to put it on your calendar and welcome Cary and his team to our community! Also in September we’ll have a Ribbon Cutting at the new Sherwood Forest Event Center located at 7400 Hickman Road here in Windsor Heights.. This is an exciting new space for special events, food and fun. Perfect for weddings, business meetings or any special event and the facility is BEAUTIFUL. This Ribbon Cutting will be on Thursday, 20 September at 5:30pm at the event center. Our Chamber Member, Big Green Umbrella Media the publishers of Windsor Heights Living and 21 other community magazines is putting together a SOURCE Magazine for businesses in our community. Think of it as a community guide. Your Chamber is taking part in the effort and this is your opportunity to schedule space for ads coupons, etc. in the directory. Jay Mathes is the person responsible for the effort. When he comes calling welcome him and listen to what he has to offer? One of the many benefits of being a member of the Windsor Heights Chamber is that we can put together a short (under 60 second) video for you. Now, true, these are not studio quality but it is something that you can use in your marketing efforts, post on your Facebook Page or LinkedIn or Twitter. Give us a call and we can get that done. Here is one we recently did for Sweet Swirls of Windsor Heights.